Today a new version of Bopup Communication Server has been released. Version 3.3.21 contains small improvements and adds printing support for a tree of Organizational Units and contacts that are available to currently selected OU. 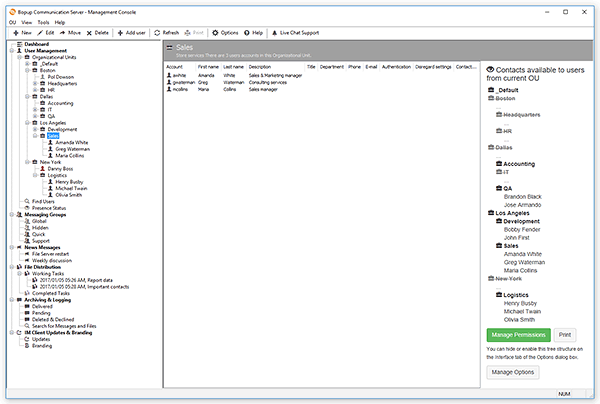 That tree structure can be displayed on the right from the users list if an Organizational Unit is selected in the Management Console. Previous versions of the communication server did not show that tree structure by default. In order to enable it and get visible the appropriate option called "Display available contacts on the right in the Organizational Unit views" must be checked on the Interface tab in the Options dialog box. See the "Options. Interface settings" topic available in Online Help.